Typical startup costs for wholesale cannabis cultivation businesses launched in the last three years amount to $42 per square foot, according to a Marijuana Business Daily survey of executives in the industry. Because indoor cultivators need to artificially control all aspects of the growing environment, they must bear steep costs for equipment like temperature and humidity control systems and artificial lighting sources. Many states with heavily regulated MMJ programs – such as Illinois and Connecticut – mandate indoor cultivation, which further drives up startup costs for this type of operation. 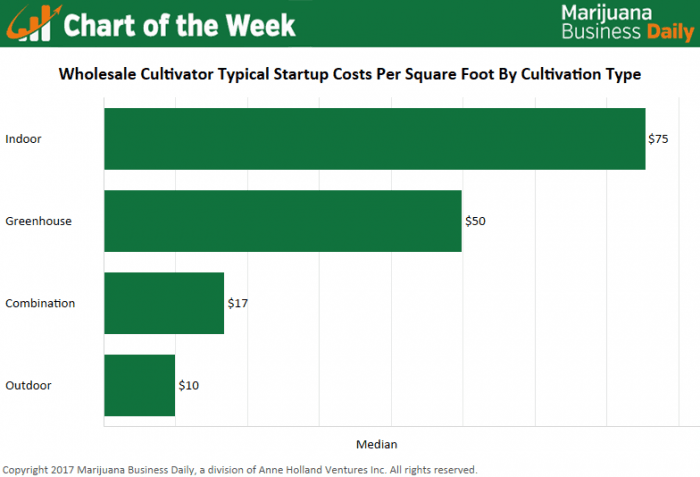 Revenue per square foot, however, is much lower for outdoor cultivators because the price of “sun-grown” marijuana tends to fall below that of indoor or greenhouse-grown flower.